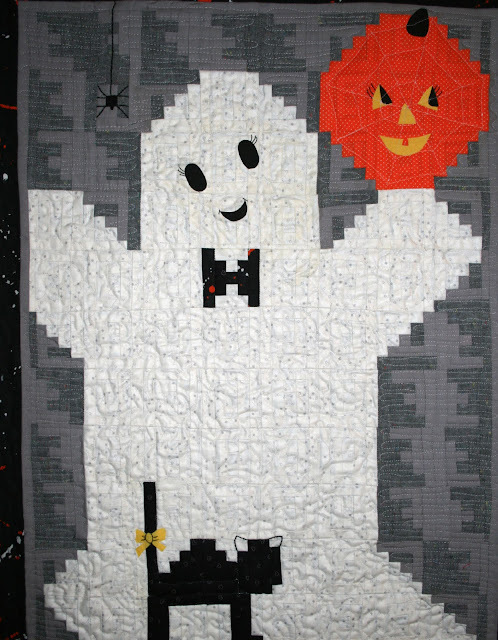 Val's Quilting Studio : Tuesday Archives #29: Ghastlies and Ghosts! So as I sat and watched Dancing With the Stars, I was searching Google and this was the first image to come up! Is it NOT amazing!!! WOW! It was created in 2011 by a fellow quilter who blogs at In Season. I was anxiously awaiting this one - can't wait to see all the Ghastlies. I remember the quilt you spotlighted - what a beauty. This is going to be a fun! Can't wait to visit everyone! Me too! Especially since I don't have anything in these themes....looking forward to lots of inspiration! Well I never bought any of that Ghastlies Fabric, although I do think it's great and fun, and I haven't made anything with ghosts either. So I can't link anything with you this week, but I can see what everyone has made. Halloween seems so big in the US. Last year I joined a blog hop and made a mini quilt. I will find the post and link it up. This year I made a witch costume for my doll and published the PDF pattern. I seem to have become a bit obsessed with the doll clothes. I will get all excited about quilting again when I open the boxes I have in storage. Only 5 weeks until we move into the new house and a new sewing space. I've never made a Halloween quilt (but it's not such a big thing here) but do love the Ghastlies fabrics. It will be fun to see what people have done with them. So fun to visit the different blogs. I have a pumpkin quilt, but no ghost quilt. I've been considering adding the search feature to my blog, but I'm wondering do you then have to go back and tag all your posts? I still plan to linkup, Valerie. It's been a busy week, but I am excited about this one, so I will fit it in somehow. Thanks again for your wonderful linky parties! No quilts in either category for me, but it's fun seeing what everyone posted. I have the search box on my blog, but have never used it myself. When I did I realized it didn't pull up what I thought it would. I may need to revisit my key words that I add to the blog.